Pupbox is a subscription box for dogs but it's actually a lot more than that. 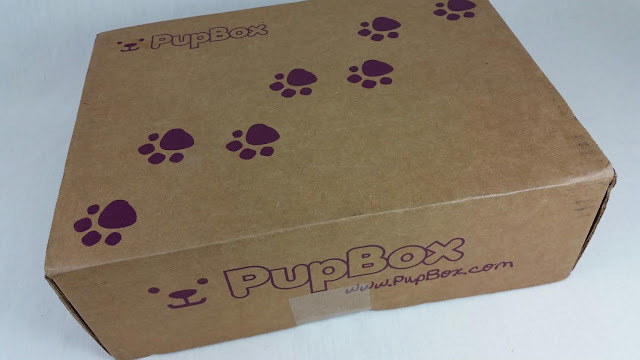 When you subscribe to Pupbox and indicate the age of your puppy, they will send a box each month dedicated to teaching you how to teach your puppy to deal with whatever is going on during that month of their growth. 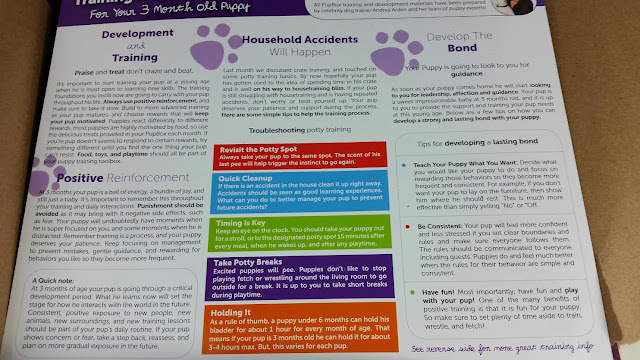 This review is for a 3 month old puppy Pupbox and focuses on teething, potty training and developing a bond. 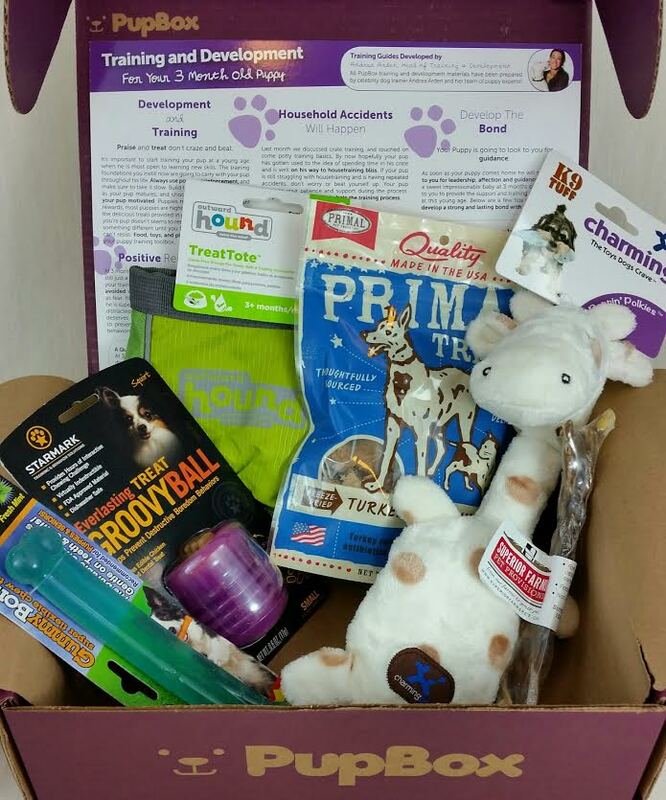 Since most puppies tend to arrive in the home right around this time, it's helpful for both the owner and the puppy to have the resources Pupbox sends. The Cost: $39/month with longer subscriptions lowering to $24/month. What You Get: Each box will include 5-7 premium products. All boxes will include 1 bag of training treats and 4-6 additional products that are selected based on the age and physical characteristics of your puppy. 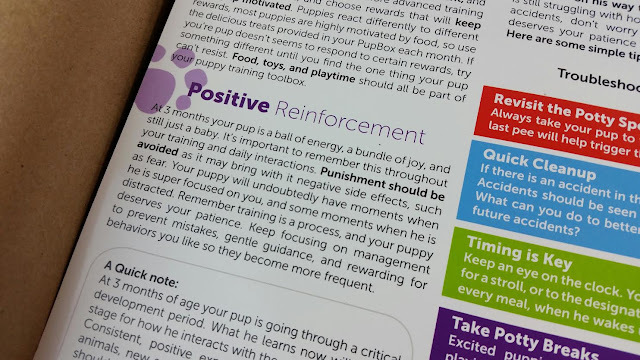 The insert includes tips and encouragement on how to help your puppy get through this stage. And they are real tips, too. 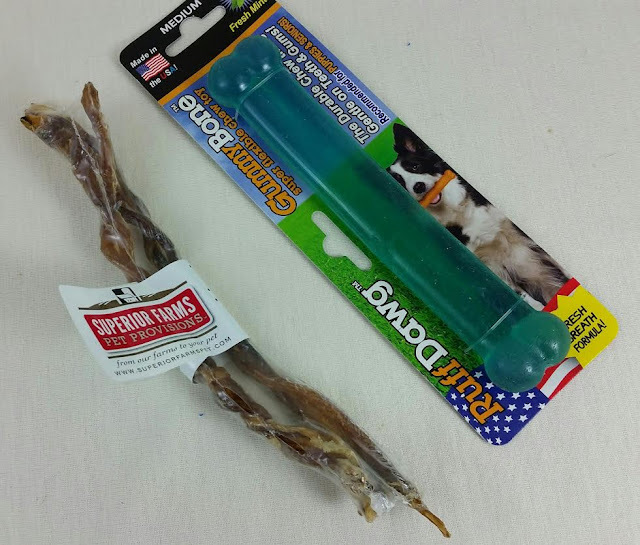 Not "give your dog chew toys." No, it tells you the kind of toys to give with options and the kind of behavior to watch for and how to redirect it. It's all things you can actually do. I also appreciate how they concentrate not only on training specific to what the puppy is dealing with a the time (potty training and chewing) but also with emotional connection between the puppy and his or her new family. It's SO important for a puppy to be positively reinforced. It makes for a happy, eager to please dog. Not only that, you'll learn things like how long a puppy can hold his bladder (1 hour per month of age), how to teach (not punish) and positively reinforce good behavior. Struggling with potty training? Well, I did. Bugsy was a freaking pee-machine. He still can't hold his bladder long and he's almost 6. I did all the things suggested in the above photo but he had to go out every half hour to 45 minutes. It was misery for me until I figured that out. So, you have to know your puppy. When I finally figured out he couldn't wait as long as I was making him (and we got a dog door), life became less cleaning up of pee and more having to open the door and let him out a million times a day. Both my dogs were pretty lucky because they had a grandma who loved them. That meant all kinds of toys and treats came their way. And that was in addition to the toys and treats I bought. 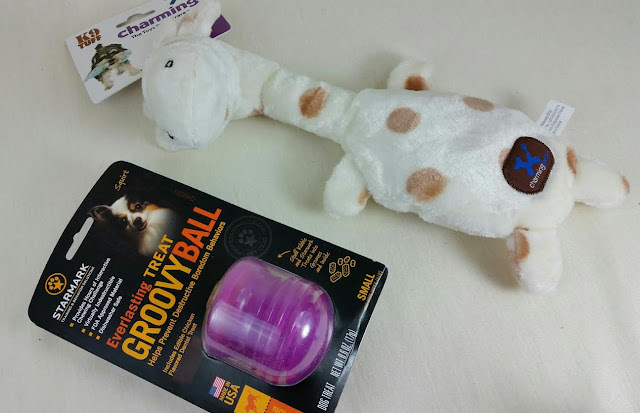 K9 Tuff Charming Giraffe Toy- This is a stuffed toy with a neck perfect for puppy jaws to grab. It's always good to have a variety of toys for a puppy to play with. Think soft, rubber, crinkly, corduroy, hard, fluffy, smooth... All the kinds! They need to get used to all those textures. And yes, do make sure to watch what they're doing so they don't swallow fluff. Lucky for me, neither one of my dogs likes to eat fluff. Starmark Everlasting Treat Groovyball- I love these things!! These were a godsend when Bugsy was teething! He chewed and chewed on this (and not my shoes or the legs on my sofa). Honestly? The treat part didn't last long but it works even better filled with kibble. These are expensive, too. I bought them because they worked perfectly at keeping my dogs busy but I wasn't thrilled about the price. Seeing this in a box makes my day! 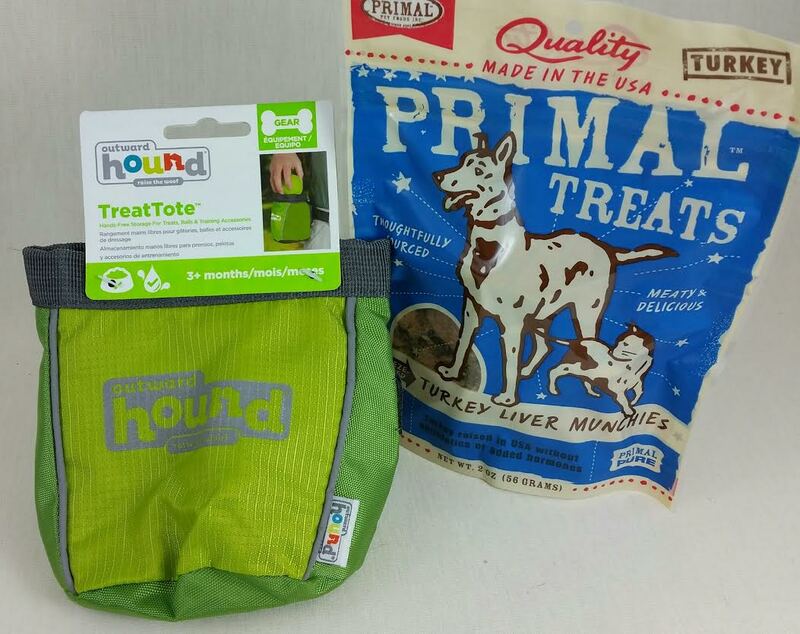 Outward Hound TreatTote- Outward Hound knows their stuff. This is the perfect treat bag to clip to your waistband or loop through your belt loop. On occasion I've looped it to my leash (around the handle). Treats are an important part of training, especially if you have a food-motivated puppy. I would measure out their food for the day and then use their kibble as treats so I wouldn't overfeed. Putting kibble in my pocket made for gross lint. These treat bags make it so easy! Primal Treats in Turkey Liver Munchies- Trainers talk a lot about a high value treat. Freeze dried Liver was my go-to treat for those instances. Worked like a charm. Of course the dogs will "leave it" if it's kibble and they get a liver piece for not eating it. They caught on quick, let me tell you. I still take liver with me when hiking. Every time they let someone by without reacting... LIVER!! Haha. They're so bad now, they'll see someone in the distance, stop and look at me, waiting. Gotta work on that. Superior Farms Lamb Pizzle Twists- This is actually two twists which was really nice because I have two dogs. Of all the tough treats and bones out there, I've always preferred bully sticks. Pure protein so there's no danger of something getting stuck or lodged and expanding. Yeah, they're gross and some of them stink but they're so worth it when it comes to keeping a puppy occupied and his teeth safely chewing something that is not your area rug. As a side note, I buy a Value Pack from www.bestbullysticks.com and it is always worth the price. Bully sticks aren't cheap but buying them this way has been perfect. RuffDawg GummyBone- This chew toy is... very floppy. It's for teething dogs with sore gums. It's designed for puppies and senior dogs. It's also minty flavored. I haven't seen either of the dogs actually chewing on this (but they aren't puppies) however it keeps appearing in new and different places so one of them likes it. VERDICT: I wish I had Pupbox when I was training my boys. When I got Dexter, I had never owned a dog before and been around them only rarely. I loved dogs but what I actually knew about them would barely fill a teacup. This kind of box would have been SUCH a help! I did take Puppy Obedience classes starting at 3 months (and thank goodness I did!) but even with those, this would have been an encouraging supplement to dealing with an adorable puppy the size of a potato that can chew his way through just about anything. It also would have been nice to have a sturdy card like this to show my husband since he couldn't come to classes with me. These cards are way better than what I got at my class. Haha. I really have to recommend this box if you're thinking about getting a puppy. Hey, I know Christmas is coming up and kids loves puppies! But this would be a great way to help your puppy and teach the kids what they need to do. It also would be super helpful if you're a first time dog-owner/puppy-raiser and you need a little help making sure you are doing the right thing. I was terrified of screwing up and raising a neurotic dog. This would have helped ease my fears. This box is a little more expensive than other dog boxes but it has, by far, the best value. At least this particular box does. Most dog boxes tend to value right around the price paid but this one exceeds it by quite a bit. And they also are providing invaluable information, as well. I'd happily consider that part of the value, for sure. If you would like to sign up for Pupbox, you can do that right here. Use coupon code BITS10 to get $10 off your first box. That's actually a really great deal. There is a profile to fill out tailored to your specific pup which you'll need to fill out but after that it's sit back and wait for your box to arrive! What do you think? Am I the only one that thinks this would have been awesome to have while raising a puppy? *This box was sent to me for review purposes. All opinions are mine.